Gil Kerlikowske has been confirmed as the Obama administration's new drug czar. WASHINGTON (CNN) - The U.S. Senate Thursday confirmed Seattle, Washington, Police Chief Gil Kerlikowske as the new head of the Office of National Drug Control Policy. "I am pleased that Mr. Kerlikowske supports combating drug use and crime with all the tools at our disposal, including enforcement, prevention, and reatment," Senate Judiciary Committee Chairman Patrick Leahy, D-Vermont, said in a written statement. "I have always advocated vigorous enforcement and punishment of those who commit serious crimes. (But) along with others who serve in law enforcement, I also know that punishment alone will not solve the problems of drugs and violence in our rural communities. ... I congratulate Chief Kerlikowske and his family on his confirmation today, and I look forward to working with him in the years ahead." Kerlikowske, 59, is a military veteran with 36 years of law enforcement experience. He has headed Seattle's police department for the last nine years. 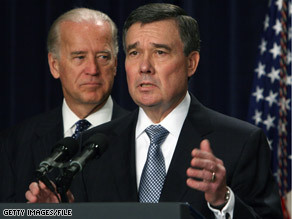 Kerlikowske will take over for John Walters, who held the position under President George W. Bush. The job of drug policy chief entails overseeing the agency that sets the country's drug control strategy. I want to know his position on the decriminilization of petty marijuana offenders. Where in the Constitution is the Federal government given the power to create an Office of National Drug Control Policy, to even have a national drug control policy, or to have any position at all or take any action at all on whatever use American citizens may chose to make of "drugs?" Answer: it doesn't. And the Federal government is quite clearly violating the Tenth Amendment in meddling in matters that are "reserved to the states respectively, or to the people." As far as I'm concerned, a good "litmus test" for the new Supreme Court justice is where s/he stands on the constitutionality of such Federal usurpation of powers not granted to it by the very document that established it. We don't need a drug czar. We need rational drug policies. Legalization has been proven to reduce drug-related crime and drug use. It's truly a silver bullet for this issue. Hopefully there will be some Harm Reduction strategies adopted, as the "War on Drugs" is not really doing, well. . .anything to curb the levels of available drugs, the violence associated with those drugs, and never mind about the available treatments for those who are substance dependent. I'm a conservative and even *I* can admit drug prohibition is a failure. Stop making kings out of dope lords. Remove law enforcement officers from the middle of the drug war. Empty our prisons of "the stoned and the stupid" to make way for REAL criminals. Once again, government creates a problem (nearly ALWAYS through their "just do something," short-sighted, feel-good, do-gooder legislation) and then has to come back later with another "fix" to fix the problem they caused in the first place. Prohibition didn't work with bulky, not-easy-to-hide-or-smuggle liquid intoxicants... so how in the hell do they think they can keep the lid on powdered and leafy intoxicants small enough to be hidden in your pants pocket? ... your tax dollars brilliantly "hard at work" again. "I also know that punishment alone will not solve the problems of drugs and violence in our rural communities. … "
What kind of an idiotic statement is this. Our Rural communities??? I'd say dementia has set in for Patrick Leahy. Take a look at your drug infested large inner cities before you point fingers at rural communities. The "war on drugs" is a failed policy. We can not even keep drugs out the prisons, how can we police it in a free society. This prohibition is a big waste of tax payer money. Time for a major policy change, begin to respond to the problem for what it is a public health issue not a crime. Control it like we do with alcohol and tobacco. Somebody ought to do somethin' to stem the tide of drug related sins and sow the seeds of sobriety and a serenely sedate situation. Nip the bad habits in their buds and be bold in bolsterin' beautiful behaviors sans drug abuses, drug czar or no. This is another meaningless patronage position we could do without and really be better off with out. As their own web sites show the number one demand of Obama supporters is the legalization of marijuana. This is like having Charlie Rangel in charge of tax policy for Congress, oh wait, he is. If not for illegal drugs, Gil wouldn't have a job. Petty mj offenders are not in our jails, people. Please. Kerlikowske and Obama are RIGHTLY, FIRMLY against any kind of decriminalization/legalization. If Obama and his cohort want people to stop calling them socialists and communists they need to stop appointing "czars" who will be granted total control over an aspect of American life. I swear, this is the presidency from the Twilight Zone! Considering I grew up with Kerliskowski as the big chief of the SPD, I wouldn't go so far as to say he's going to establish any sort of de facto decriminalization policies. However, let's not forget that Kerliskowski was the top ranking officer in SEATTLE, one of the most progressive American cities on the issue of drug policy. When Washington voters overwhelmingly voted for Medical Marijuana in '98, Kerlikowski – though not without his reservations – followed faithfully the people's decision. More recently, responsible adult toking was essentially "decriminalized" (lowest-priority), and Kerlikowski put his opinions aside and once again instructed his officers to enforce the new law. Although not pertaining to pot, it's important to keep in mind Seattle has had a needle-exchange program for some time now, and Kerlikowski/SPD hasn't interfered. Progressive policies focusing more on harm reduction as opposed to trying to jail us all? Yes, I think we can look forward to a more sensible drug policy. Mr. Kerlikowski's first item of business should be to shut down organized crime the only way that has ever worked: take their source of revenue; legalize, regulate and tax it. America needs real solutions, not a phony "war on drugs" made to leverage voters. The whole "drug czar" thing started with Reagan, its needs to stop. Drug "czars" have done nothing to solve the problem of our addicted society. Excuse me, but I've known MANY over the years that have been jailed, some for 10 years or more, for marijuana offences. The only ones that don't get procescuted for possession is the politicians and the cops. I still don't get why the government hasn't figured out that prohibition NEVER works. And people that want to stop doing drugs still can't get help without exposing themselves to criminal liability. I didn't vote for Obama, but if he get's rid of this unconstitional drug war, he'll sure have mine and lots of others votes in 2012..!! "I also know that punishment alone will not solve the problems of drugs and violence in our communities." It is disappointing that we have a supposed enlightened group up there right now, and the best they can do is parrot the same old lines from the failed 'drug war'. Legalize MJ and you will take a huge load off the cops and free up the DEA to go after Heroin and Cocaine. Although the real answer is to legalize all of it and deal with the addicts. That would cost a lot less and disrupt a lot less lives. But.... no one in the DEA wants to actually be a cop, they just like getting paid the big bucks to go to cop 'conventions' and bust down doors. Why do we really need another CZAR ? Lets just start having those that are paid to, do their jobs. We don't need all these special positions created for political payback of some sort. It is a total waste of our money Mr. President. You complain about waste, well here it is and you are creating it. As long as so many people on both sides of the law are making so much money on illegal drugs, legalization will never happen.